I visited Rehoboth Beach, Delaware last week for some intuitive training. While I was there I got a chance to visit the Cape Henlopen State Park, former home of a U.S. Navy base known as NAVFAC Lewes. This facility was one of many that was tuned to track deep-diving Soviet submarines, some thousands of miles away. The program was called SOSUS for Sound Ocean Surveillance System and was highly successful at tracking subs until that traitor Navy Chief Warrant Officer John Walker Jr. sold it out to his Soviet handlers. To defend against the threat of Soviet submarine operations inthe eastern Atlantic or off the coast of the U.S., in the mid-to-late 1950s, the Navy established an underwater Sound Surveillance System (SOSUS). Naval facilities (NavFacs) of the system were located along the coast of the U.S. and Carribean Islands. From those facilities cables ran to the edge of the continental shelf with hydrophones that could detect the sound of submarines. The mission of these NavFacs was “To provide world-widemaritime surveillance and cueing from undersea sensors to warfare commanders and intelligence partners in support of Anti-Submarine Warfare (ASW).” But, since that mission statement was (then) classified, a cover story was provided explaining the role, purpose and operations of the stations as an extension of and adjunct to the acoustic and oceanographic surveys conducted by the Navy’s fleet of research ships. Soon the Navy realized that NavFac Cape May was threatened by beach erosion, which would eventually undermine the station buildings. 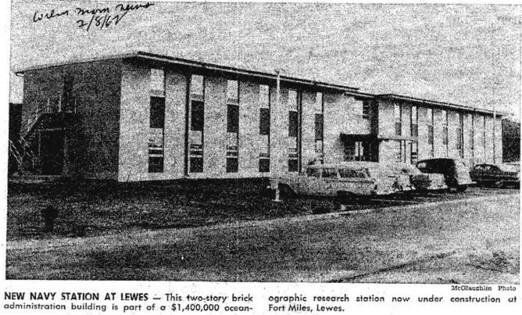 Thus, in September 1960, Delaware Senator Allen J. Frear announced that $1,500,000 had been allotted for the construction of a Navy oceanographic research facility at Fort Miles, which had been a WWII Army Coastal Defense Artillery fort and was still being utilized as an Army training facility and as a Department of Defense military receation center. In October 1960, the Navy had obtained 626 acres at the southern end of Fort Miles.